Large Marge Busted Out of the Joint! It has been seven days since I installed the package of bees so today I opened the hive to see if Large Marge was still in the queen cage. I found the queen cage empty and the candy plug completely eaten away. 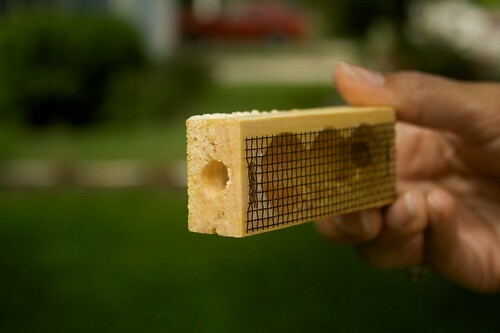 The bees had also drawn out a lot of comb on the 6 middle frames. I switched frame positions for 1 and 2 and 7 and 8 to encourage the bees to use all eight frames. Bees have a tendency to ignore the outer most frames in the hives without a little encouragement. I also went ahead and added an additional super on top.